PLO Secretary-General blasts US-led conference in Warsaw, says it is an attempt to "destroy the Palestinian National project". 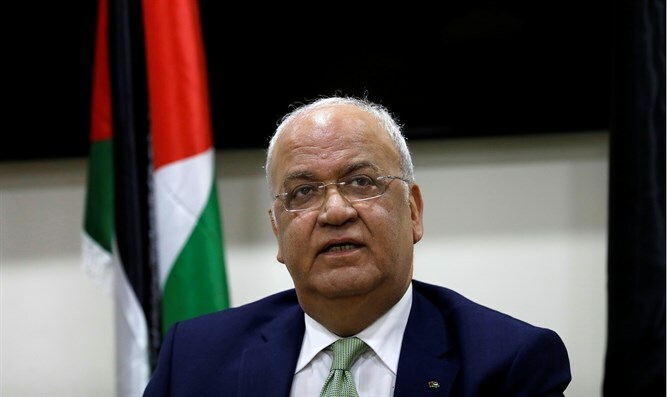 Palestine Liberation Organization (PLO) Secretary-General Saeb Erekat said on Friday that Palestinian Arab officials will not participate in next week’s US-led conference in Warsaw on the Middle East. “The Warsaw Conference is an attempt at bypassing the Arab Peace Initiative and destroying the Palestinian National project,” Erekat wrote on Twitter. “Regarding statements that we have been invited, we can say that only today there was some contact from the Polish side. Our position remains clear: We are not going to attend this conference and reiterate that we have not mandated anyone to talk on behalf of Palestine,” he added. Earlier, a US official said that Palestinian Arab officials had been invited to the conference, though he stressed the event was “not a negotiation but a discussion” on Middle East peace. White House senior adviser Jared Kushner, who is US President Donald Trump’s son-in-law, will also take part in the conference, the official confirmed. Kushner “will discuss the administration’s efforts to advance peace between Israel and the Palestinians and also take questions from the audience,” said the official. The official’s comments came a day after the Palestinian Authority (PA) rejected the conference and branded it an "American conspiracy". The PA has rejected the US peace plan being formulated by the Trump administration before it has even been unveiled and has been boycotting the US ever since Trump’s recognition of Jerusalem as Israel’s capital in December of 2017.